Pierce acorn squash with a fork 2-3 times. Microwave each squash separately for 6 minutes, or just until the flesh becomes tender enough to yield when pressed. Slice in half, remove seeds with a spoon and place cut-side up (skin down) on a parchment-lined baking sheet. In a large bowl, stir together quinoa, tomatoes, corn, black beans, cheddar and green onions. Spoon into the center of each acorn squash. Bake for 20-25 minutes, or until cheese is melted. Mix diced chicken, cooked ground beef or carnitas in with your stuffing for a heartier meal. Let’s taco ‘bout this awesome dinner. Truth: I love squash. Any kind of squash. Especially acorn squash. Truth: Every fall, I buy an acorn squash, get it home, let it sit, don’t know what to do with it, and eventually chuck it in the trasholio. It is not a proud moment. How is that I, food lover to the nth degree, can’t figure out what to do with a darned squash I love? This is the question I ask myself. Followed up by: If I create recipes for a living and still can’t figure out what to do with an acorn squash, how is any home cook (like your lovely self) supposed to know what to do with that hard little nugget of autumn goodness? So it’s high time for a change. 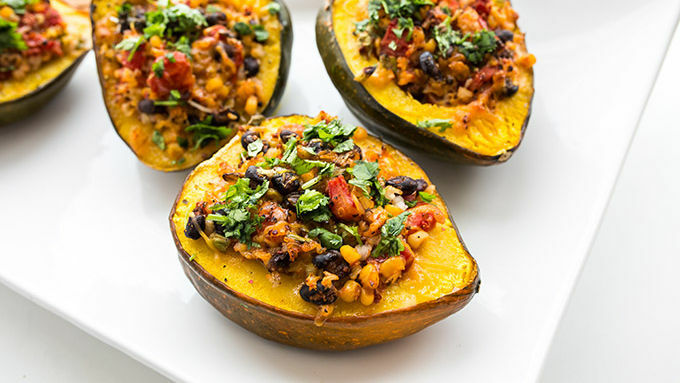 Because acorn squash is just too good to pass up. This is its season. It has arrived. 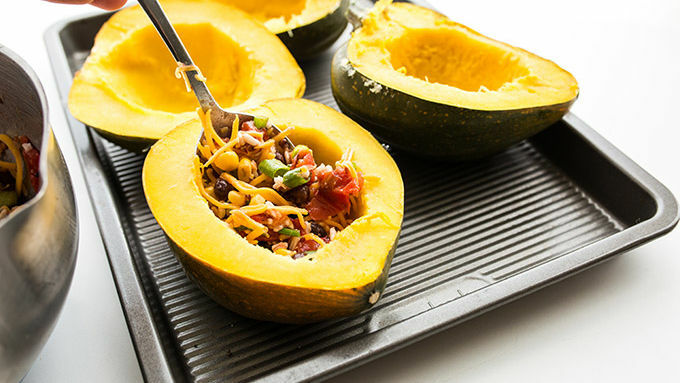 It’s time for acorn squash to shine. And thusly, I hit the kitch for you (and me), to figure out a super quick, tasty way to prep this winter squash up, stat. Get ready. Get set. 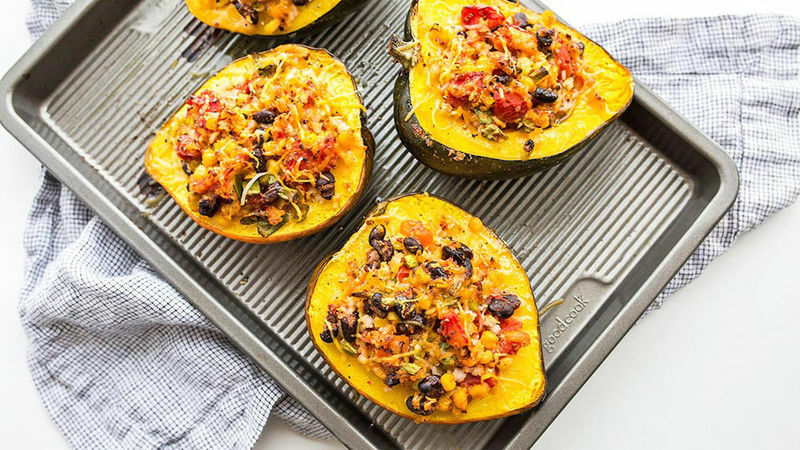 Let’s acorn squash. It all starts with a basic lineup of stuff we know and like. Beans, quinoa, diced tomatoes. What’s to love? (And it just gets better from here.) Stuff, bake and enjoy!